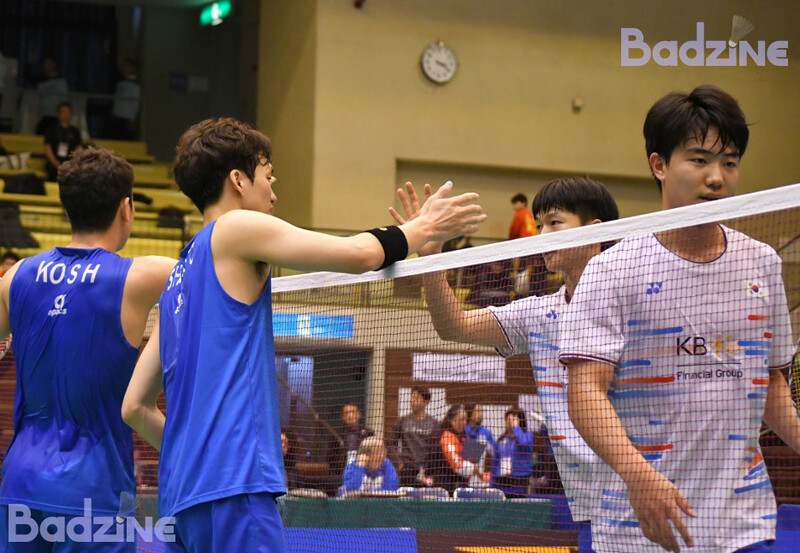 Japanese and Korean B teams clashed in Osaka with some of Korea’s oldest and youngest international competitors winning titles, while Japan held onto 3. The Osaka International Challenge was held in the Moriguchi Gymnasium in Osaka from April 3rd to 7th. Most of the players were there in an effort to get as many ranking points as possible before the start of the Olympic qualification period. The first final at the 2019 Osaka International Challenge was men’s singles, between Takuma Obayashi and Koki Watanabe. Watanabe, who won at the recent Orléans Masters in France, is one year older than his high school team-mate. This final marked their first match in a senior tournament. Obayashi got out to a good 18-13 lead in the first game and although Watanabe didn’t give up and caught his opponent at 19-all, Obayashi held on to win the first game. The second game was also close till 17-all, as Watanabe controlled the shuttles to the four corners. Obayashi wanted to decide his title in 2 games, but despite moving as fast as he could, it was Watanabe who got the second game with 4 consecutive points. The third game was all at Watanabe’s pace. The 21-year-old had more stamina and was able to up the pace, while his teenaged opponent was not able to handle the faster pace. Watanabe won the decider easily 21-7. 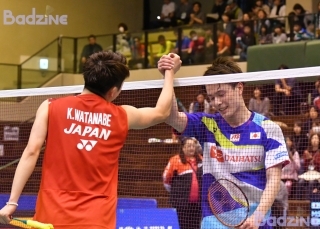 “I knew both of us were very tired in the final,” Watanabe said after the match. “I was not able to keep my feeling strong in the first game because Obayashi played well so I tried to play at my pace, not my opponent’s pace. I had more stamina than Obayashi in the third game and I had him moving around a lot. My tactics worked well today. Next up was mixed doubles, between defending champion Kim Won Ho and reigning Asian Junior Champion Guo Xinwa. Both players, age 19 and 20 respectively, already have Grand Prix/Super 100 titles to their name on the senior circuit but were in Osaka with new partners. Jeong Na Eun of Korea played against both Guo and his new partner Zhang Shuxian in junior events last year. In 2018, Kim Won Ho won the title in Osaka with Lee Yu Rim, just a few weeks before she suffered a knee injury that required surgery. Lee is back on court in domestic events but is not on the 2019 national team. Jeong, a World Junior Championship semi-finalist, is the newest female member of the Korean national team and this was her first outing for and Kim Won Ho. China’s Guo pelted some strong smashes at the Korean pair but the Koreans’ patient defense was more than a match for China’s attacking play. The Korean pair got their first title in their first international tournament 21-17,21-15, also Kim secured his title defense. The third match was women’s doubles, between Rira Kawashima / Saori Ozaki and Sayaka Hobara / Natsuki Sone. There were no senior national team members this time. Hobara won a World Junior Championship title in 2016 in Spain but her then-partner Matsuyama got a new partner in another company team and joined the national B team, going on to win a Super 300 title last year. Hobara, meanwhile, joined Sone to take the first senior international title for either player as they won in their home country in three games. 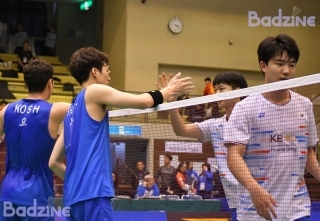 Korea national team tested three new pairs in this tournament and all of them reached the semi-final stage, along with former World Champions and independent players Ko Sung Hyun / Shin Baek Cheol. Three other independent Koreans – Yoo Yeon Seong, Kim Duk Young, and Kim Sa Rang (again playing with Tan Boon Heong) – failed to progress but Ko/Shin moved strongly into the final. Kim Won Ho and Park Kyung Hoon bested Kim and Tan in the quarter-finals but on Saturday, they fell to Kim’s former partner Kang Min Hyuk, now playing with Kim Jae Hwan. In the fourth final on Sunday, Ko/Shin played a stable game from beginning to end. While Kang/Kim moved plenty fast, they had less success keeping their shuttles within the lines and away from the net. Ko/Shin got the title 21-13,21-16 in 32minutes. The last match on finals day was women’s singles, between Japan’s Saena Kawakami and Korean Lee Se Yeon. It was the first time for Lee to reach even an international semi-final. She had been in the quarter-finals twice in Osaka, but that was before she changed her name from Lee Min Ji. The Korean was coming off an upset of top-seeded Minatsu Mitani in the semi-final, a result that put her in a final for the first time. On Sunday, though, Kawakami controlled the shuttles, patiently sending them to all four corners. Lee moved fast and managed to return the shuttles at the beginning of the match, but Kawakami increased the pace and had the stamina she needed to keep her good lead to the end. Kawakami won 21-14, 21-10 in front of her friends from her home town Kyoto.